Hi everyone, first post here (still need to get some decent pics for the noob forum) but I need some professional advice. Found someone who's wanting to trade stock TRD rims with 285/75/R18's with minimal usage for stock TRD rims and tires which I have. My question to you guys is I have a 08 DC TRD edition with stock lift, will these fit until I can get a leveling kit on there? Hopefully no more then a month or so but this deal looks too good to pass up if I can make it work. Kyle.... welcome to the site. these tires measure 34.8"... they WILL rub.. you will need a 2.5-3 level kit in front for them to fit. your truck CAN fit 33" tires without a level. What is your stock tire size? Thanks guys, Hmmmmm...... Guess I need to look at those 5100's or SOMETHING here sooner then later if I want to do this. Any recommendations for leveling kits? Have been really thinking about the 5100's but still undecided. I have the 5100s on since December 23rd and they ride comfortably with the lift. It's not the exact same ride quality as OEM but a good alternative if you're trying to save a little money. But, there are quite a few reasonable leveling kits less than $300 that will also help with the forward rake that annoys a lot of people....and get those tires you want too. 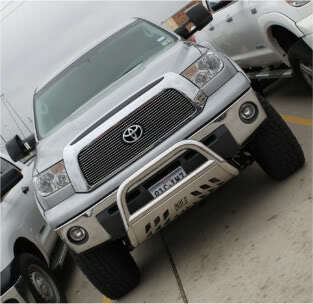 Check out TCTundra's build log..he's got a fairly priced 3/1 leveling kit. me and TRDDunn have the Fat Bobs Garage 3/1 kit... of course, my truck in a 1gen Tundra. if you want some a bit more rugged then check out the Low Range Offroad and Truxx kits. they usually run about $300-$350 for a set. What vendor do you recommend for it? Thanks everyone for your help, just gotta see what I can afford at this point.